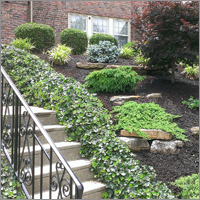 Raymond Landscape specializes in numerous aspects of landscape design, installation and maintenance. Our services include expert site analysis, new installations and re-design of existing landscapes. 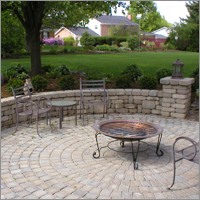 In addition, Raymond Landscape specializes in hardscape construction such as paver & stone patios, walks, steps, driveways, walls, fire pits, outcropping, dry creeks & more. At Raymond Landscape, we feel that a custom-designed landscape should be tailored to your family’s needs and interests. Every aspect of the landscape plan must work together to create a site that is both visually and functionally desirable. We offer unique designs, along with interesting and unusual plant material. Landscape customers are always invited to visit our nursery and to view or personally select the plants that will be installed at their home or business. 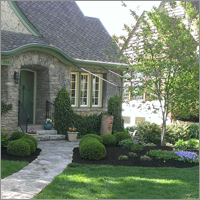 A qualified landscape professional is trained to evaluate the existing landscape and incorporate selected existing plants or features into an updated plan to give your home or business a new and fresh look. 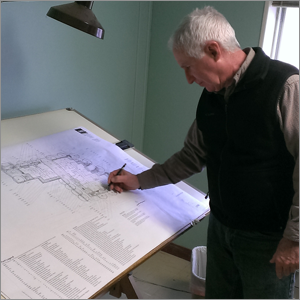 Our registered landscape architect completes expert site analysis and professional landscape designs. A quality landscape architect has the educational background, training and experience to assist property owners not only with all of the planning stages, but also with resolution of problematic issues specific to your property such as drainage, erosion, privacy and more. At Raymond Landscape, attention to detail is our only way of business. A well-designed home landscape is both aesthetically pleasing and functional. Whether you are building a new home or renovating all or a portion of an existing landscape, it is important to incorporate any future projects into a master landscape plan. A master plan will ensure that all of your ideas work together and will eliminate the need to redo existing installations when it comes time to landscape additional areas. Some homeowners choose to divide the overall landscape plan into several projects to stay within a budget or for other reasons. 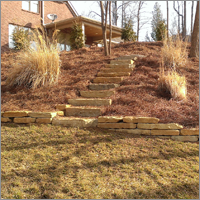 This allows the homeowner to achieve his or her ultimate goal of a “finished” landscape over a period of time. Enhance and extend your outdoor living space with durable, professionally constructed paver or stone terraces, dry-stacked or mortared walls, walkways and paths. Raymond Landscape uses a wide variety of top-quality stone building material in an endless array of colors, textures and styles to compliment the existing landscape and architectural style of your home or business. Hardscapes are the basis and strength of any landscape. Quality hardscapes constructed by Raymond Landscape add dimension to your landscape and are built to last. You and your family will enjoy this timeless addition to your home for many years to come! Professionally installed landscape lighting not only increases the value of your residential or commercial property, but also provides safety, security and nighttime beauty. Our staff can highlight your landscape with low-voltage lighting custom designed to accent specific architectural features of your home or business, provide safety, security and lasting beauty. A certain tranquil, calming effect is created by the presence of water within a garden. The reflection of trees and surrounding plants radiating from a still pool of water creates a sense of peacefulness and serenity, while the steady splashing of a fountain or gentle murmur of a waterfall provides a sense of lifted spirits and relaxation. 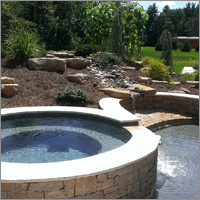 The professionals at Raymond Landscape would be delighted to incorporate a water feature into your custom-designed landscape plan – just ask! Color or “Spruce Up” for Special Occasions – attention to detail is our specialty!